I'm still being inspired by Margaret Bloom and her new book, Making Peg Dolls, well actually I guess her book blog tour. Last Friday, Anna Branford was the book tour stop and she shared some adorable animal peg dolls. Now of course there is more to the story. Last Thursday when I went to pick Hazel up from school, I saw a bluebird fly by in the long driveway to the school. Now a bluebird in the winter is very unusual here, but its brilliant blue wings and reddish pink breast made me certain it was. Now remember this is the day before the blizzard hit here. Poor bird. Anyway, I went inside and was talking to the teachers about the bluebird and one of them mentioned how seeing a bluebird always makes her and her husband happy. That night I told Hazel a story about Happy the bluebird at bedtime. Then I saw the bluebird that Margaret Bloom made at Anna Brandford's site and I was inspired. 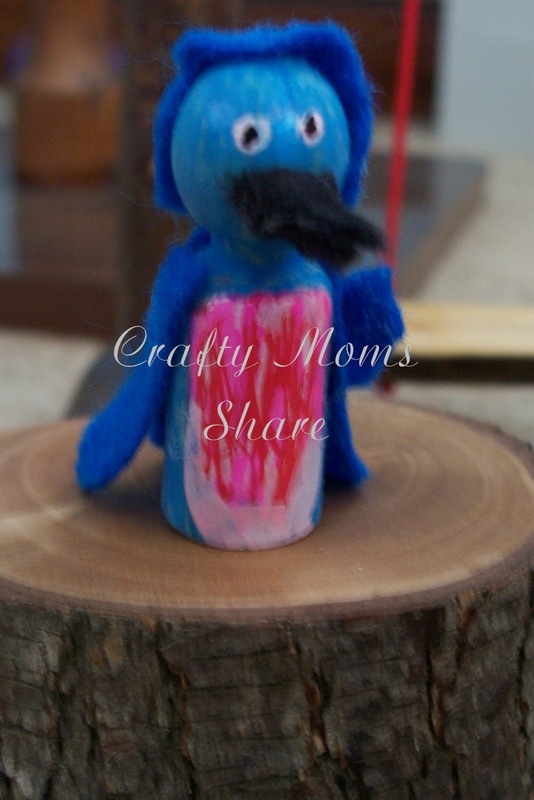 I decided to make a bluebird. Now I was a bit lazy and glued instead of sewed the head and such. But I am happy with how it came out. Next I decided on a robin. Yes, with all this snow I am thinking about spring. Plus Hazel got the book How Robin Saved Spring by Debbie Oullet for her birthday. This is a wonderful book that tells the tale of Lady Winter and Sister Spring and how the animals try to wake Sister Spring when Lady Winter uses her magic to keep Sister Spring sleeping so she can stay reigning the world. In the story you find out why some animals hibernate and why the maple tree gives sap for syrup and other wonders in nature (like why the robin is red breasted). Last year I needle felted her Lady Winter and Sister Spring dolls, but I don't think I ever shared them with you. Then wanting to get away from birds, I decided to make a red fox. 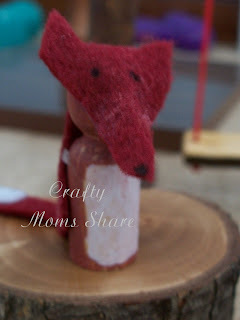 A fox has been in a few of our stories as of late, so I thought she would appreciate it. One of her favorite play things is to use her peg dolls or even Barbie dolls to make puppet shows and tell stories. I love her creativity! She has asked me to make a seagull, pigeon, chickadee, gold finch, cow, horse, parrot, ... next. I guess I better get some more peg dolls. 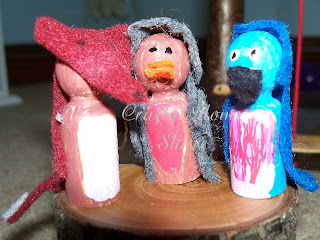 For my previous Margaret Bloom inspired peg dolls visit here. Very cute. I would have done the same thing as you. Glue before sewing anyday! These are so sweet! I do better with a glue gun than with needle and thread, LOL! I'm thinking "spring" too. 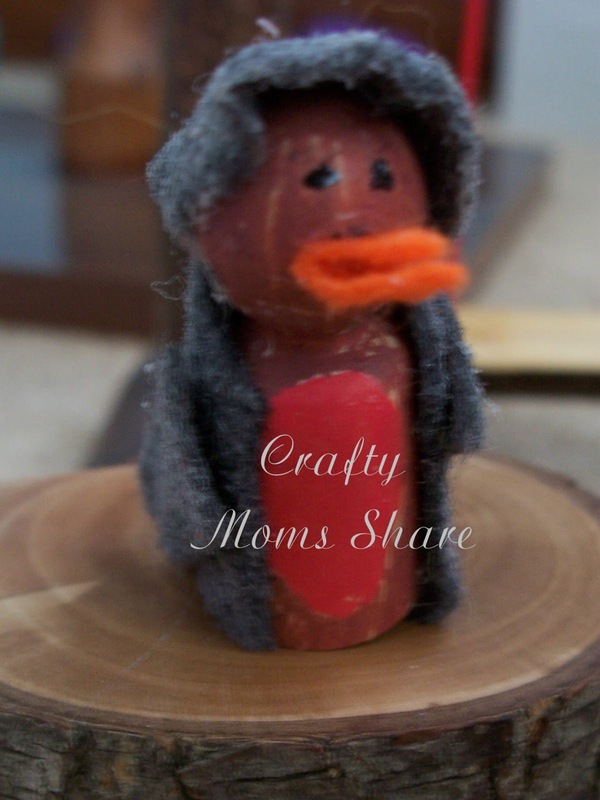 ;-) Thanks for linking up at Family Fun Friday at Happy and Blessed Home!